I was looking for ice cream shops around my workplace, when I came upon this hole in the wall. Grandma Pucci's Homemade Ice Cream recently opened in March of this year. In addition to ice cream, Pucci's also serves a variety of gelato, sherbet, and frozen yogurt. They have great specials every day including a Milkshake Monday. Today, the place was packed with patrons who were taking advantage of the two scoops for $2 deal. I normally don't like anything banana flavored, but the Banana Graham was the first item on the menu so obviously it had to be a must try. The banana was subtle and the little graham bits helped buffer the otherwise peculiar taste of banana ice cream. For my second scoop, I thought the best match would be the Blueberry Cobbler. It tasted just like a blueberry pie, but with the right amount of sweetness. The two flavors kind of became interchangeable, so next time I think I would try something more drastic like Canoli Cream! Nonetheless, the handmade ice cream let's your taste buds take a blast to the past. 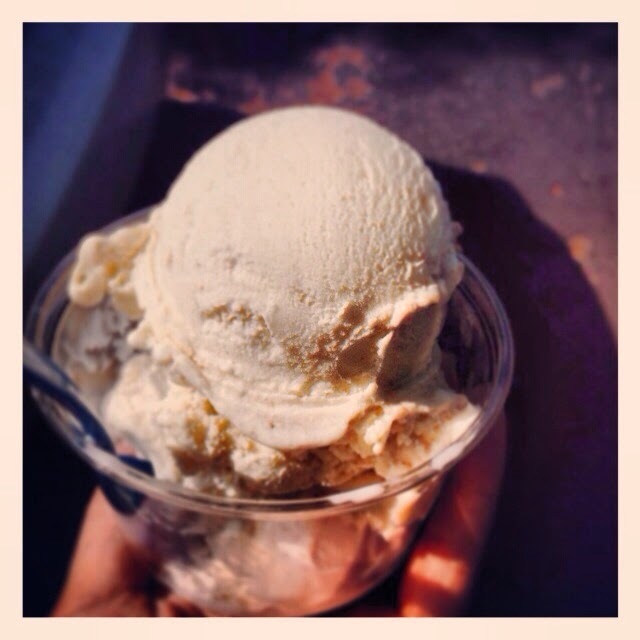 The old fashioned creamy texture is replicated in Grandma Pucci's ice cream, made the good old fashioned way. Move over #tacotuesday, it's all about #twoscooptuesday!!! (Although I'm still going to grub on some taco specials tonight). Don't forget to hashtag #20DaysofIcecream if you want to join me in the 20 day Ice Cream Challenge!